Sign up with your email address today to receive an instant 20% OFF labor on your next automotive repair with us! *Excludes alignments & oil changes. Free stuff only. We respect your privacy. $59.95 Alignments | All Day. Every Day. Serving our community since 1996. Terry's Alignment Shop is family owned and operated right here in Concord, NC. Since our company opened it's doors in 1996, we've treated every customer like they were a part of our family. We strive to maintain the friendly, dependable service that you love, while providing an array of automotive repair services at the highest possible value. We specialize in alignments, NC State Inspections, brakes, and offer a vast variety of services to provide you with a full selection of maintenance options. We are dedicated to serving you at the highest level possible. Contact us today and schedule an appointment, or if you don't feel like reaching out directly, use the contact form at the bottom of this page to set up a visit yourself! A vehicle alignment is actually an elaborate process that brings the car's suspension into its proper configuration, positioning and adjusting components so that wheels are aligned with one another and the road surface. The alignment should be performed by an experienced mechanic, who uses an alignment machine. Our alignment machine features clamp-like devices that are attached to the wheels of your vehicle (which is raised up in the air) and links to a computer that helps make precise measurements. We will also take this opportunity to make sure that no additional suspension components are excessively worn or broken. 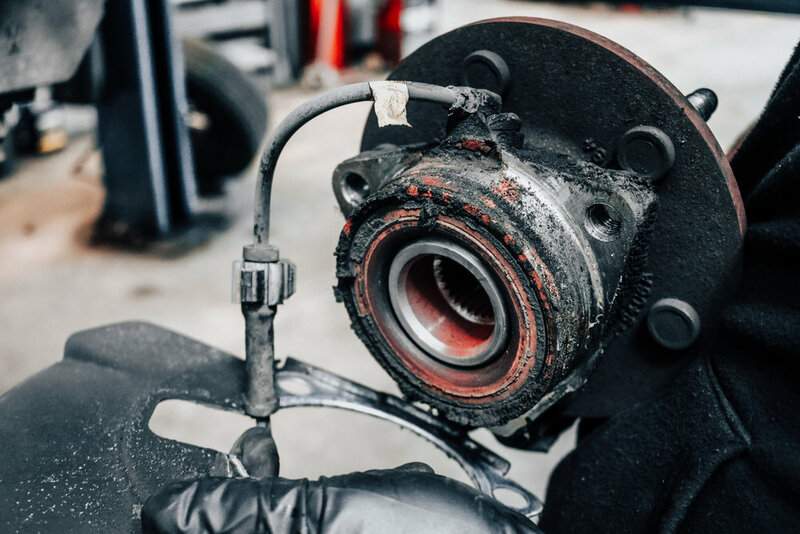 We'll inspect all of your brake components, including all the lines, hydraulic systems, and hoses. We check the quality of your brake fluid, and if contamination is found, we’ll replace it. Inspecting rotors, drums, and brake pads is all part of our brake services. At Terry's Alignment, you are part of our family. And we know keeping family out of harms’ way is a top priority, and that coming to a safe and complete stop while driving helps ensure their safety. We will test drive your vehicle both before and after service to guarantee everything is properly functioning. We continue to grow Terry's Alignment Shop family through our commitment to quality brake repairs. An oil change is one of the most basic aspects of automotive ownership. The motor oil used in a vehicle is essential for the machine's operation. However, the oil becomes ineffective after a while and must be replaced with new, fresh oil. This is accomplished with an oil change. An oil change occurs when the drain screw at the bottom of the oil pan is removed. This process takes place over a disposal container to prevent oil waste (and an oily mess on the shop floor). Once the oil is drained, the drain screw is placed back into the car's oil pan and the oil filter is replaced. Next, new oil is poured into the vehicle from an access spout on top of the engine. In short, a minor tuneup is usually needed around every 30,000 miles or so, or depending upon the vehicle owner's preference. The electrical components replaced in a minor tuneup usually consist of spark plugs only. The new spark plugs are gapped to manufacturer's specifications and installed in the vehicle. As a rudimentary inspection, we will check the timing, and make visual inspections of the air filter, cap, rotor and plug wires. Older vehicles may receive the installation of points and condenser as part of a minor tuneup. An oil change (with filter), on rare occasions, can be added to a minor tuneup, as well as a suspension lubrication. Ordinarily, vehicles receive oil changes as frequently as every 3,000 to 10,000 miles, including oil and filter changes. All fluid levels, including transmission, power steering, radiator and brake fluids receive visual checks, and get a topping-off if the reservoir requires less than a quart. Struts are an integral component of your vehicle’s suspension system, and kind of important if things like handling, stopping, and riding in comfort matter to you. Improved handling, shorter stopping distances, and a smoother ride are the benefits you realize from changing struts. Worn shocks can make for an uncomfortable ride, but, more importantly, they can compromise your ability to control your vehicle. So, it's important to keep shocks in ship-shape. You can also call or email us to schedule an appointment. *Once you send over your inquiry, we'll contact you ASAP. Click the button below!